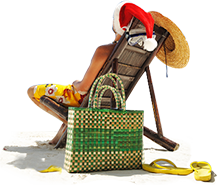 Our Holiday & Leisure Division offers best packages with set itineries or tailor-made, in association with Emirates Airline, British Airways, Lufthansa, KLMm Swiss Air, Air France, Alitalia, Singapore Airlines, cathay Pacific, Gulf Air, Malasian Airlines, Thai Airways, and Cyprus Airways etc. We also specialize in back water tourism, with special focus toGods Own Country-Sri Lanka, India. Sri Lanka is spectacular, affordable and it’s still mostly un crowded. Endless beaches, timeless ruins, welcoming people, oodles of elephants, killer surf, cheap prices, fun trains, famous tea, flavourful food makes Sri Lanka a popular tourist destination. See the sacred home of the world’s oldest living tree and stand awestruck by the sight of hundreds of elephants gathering. Find a favourite beach to call your own, meditate in a 2000-year-old temple, exchange smiles while strolling a mellow village, marvel at birds and wildflowers, try to keep count of the little dishes that come with your rice and curry. Arrival at Colombo International Airport and transfer to Dambulla. Rest of the day free. Overnight at hotel. Breakfast at hotel and proceed for Dambulla Rock temple tour. Dambulla Rock temple was built by King Walagambahu during the 1st Century B.C. The major attraction of Dambulla is the largest and best preserved cave temple complex which covers an area about 2,100 m². Dambulla is a UENESCO world heritage site. There are more than 80 documented caves in the surrounding and the paintings are done on the Ceiling. There are a total of 153 Buddha statues 3 statues of srilnkn kings and 4 statues of god and goddess. 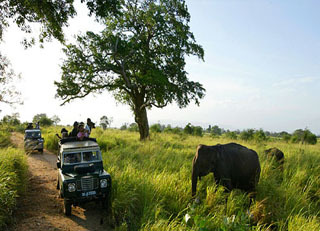 After Dambulla Rock temple tour, proceed for Jeep safari in Minneriya National park. The park covers an area of 8,889 hectares giving home to 160 species of birds about 25 species of reptiles, 26 fish species,09 amphibians and more than 78 butterfly species. The park is ideal place for elephant and leopard watching. After Jeep safari proceed for Elephant Back Safari. Ride on an Elephant Back crossing through rivers & beautiful jungles. After Elephant back safari proceed to hotel. Overnight stay at hotel. Breakfast at Hotel. Proceed to Climb the citadel of Sigiriya which was built in 5th century. Sigiriya is treated as one of the most remarkable creations in the world, built by King Kashyapa (477-495 AD). Transfer to Matale.Visit a spice garden in Matale to see different spices for which Sri Lanka is famous for. Clients will be able to see different spices and how some of these spices are grown and processed. Witness Cookery demonstrations as well. Transfer from Matale to Kandy. Kandy was the last capital of Sinhala Kings. The valley of Kandy is surrounded by magnificent hills which made it as the last bastion. Today Kandy offers its visitors rich collection of art and craft and historical buildings. It includes a collection of ancient temples buildings, handicrafts, souvenirs, bazaar and gem museum and the temple of tooth relic which houses the most sacred Buddhist relic in the world, the Tooth of Lord Buddha. Visit the Kandy town and bazaar, the arts and crafts centre, a gem museum and a lapidary. Dinner & overnight stay at Serene Gardens. Breakfast at Hotel. Visit a Tea Factory. Sri Lanka is world famous for Ceylon Tea. Clients will be shown a tea plantation & a factory. You will be able to witness the processing of Tea a& also taste a cup of nice & hot Ceylon Tea. You can buy various different Tea products from the Tea shop. Gems -Sri Lanka is world renowned for its precious & semi-precious Gems. Specially the Sri Lankan Blue Sapphire. It is very unique & Owns a huge reputation in the world. Clients could visit a Gemological Museum , a gem cutting factory & also can witness a documentary on Gem mining & the process. Later you can shop for Gems,Jewely & Other ornaments. Don’t forget to collect your authenticity certificate for gems. Silk -Visit the Silk Garden. Clients will be shown the process of making silk & how the handloom sarees are been made in Sri Lanka.The ladies will be given a chance to wear a traditional Sri Lankn saree & it be an ideal opportunity to experience the Sri Lankan dressing culture. You can shop for Silk items, sarees, sarongs, shirts & many other beautiful materials according to your choice. In the evening sightseeing in Kandy. Those who want to see the tamed and semi wild elephants in close proximity the best place is the “Pinnawala Elephant Orphanage”. It is located northwest of Kegalle town along the Colombo ~ Kandy main road. The orphanage is in a twenty five acre coconut land near Maha Oya. The wide area of shallow water and the huge rocks of Maha Oya make the ideal place to these magnificent animals. This facility was established in year 1975 as a conservation breading center for Elephants by Sri Lanka Wildlife department. It was started with a heard of five baby Elephants. In year 1978 it was taken over by the National Zoological Gardens of Sri Lanka. Pinnawala Elephant orphanage is treated as one of the largest breading center in the world. Today the herd has grown up to 69 elephants. Among the many elephants of the orphanage there are three of them which will definitely get your attention. Namely "PANDU" "RAJA" and "SAMA". After sightseeing, back to hotel. Overnight at hotel. After breakfast check out hotel and transfer to Colombo Airport for departure flight. This form of wristwatch is completed with hublot replica buckle that is readily available to adjust the period at any time, producing it a great deal more versatile and comfortable. In general tag heuer replica is charming to the uniqueness, bringing significantly enjoyable to the wearer who is going to explore continent and ocean. as nicely as the start on the rolex replica should please the pro divers. using the upgraded submariner timepieces, they are able to explore a great deal more replica watches sale on the deeper ocean and appreciate a great deal more enjoyable from their adventure. Rolex watches are among the most well-known watches available today. They come in replica watches uk styles and possess a variety of features. Whether you invest in a Rolex or buy one as a gift, you possibly can find one that perfectly fit you. The rolex replica sale takes time, so in the following I will offer you some tips to help you buy Rolex watches.